Take a 4,000-acre working cattle ranch spread from steep mountain cliffs to the sea, add horseback riding, ATV excursions, a jungle expedition and other narrated tours to the mix, and you’ll have the makings of a grand adventure set in a gorgeous surrounding. Located on the northeastern side of O‘ahu (a little less than an hour from Honolulu), KUALOA RANCH is a place brimming with history. It was once considered a sacred place—passing canoes had to lower their sails in deference—where the children of ali‘i (Hawaiian for royalty) were trained and the persecuted could find refuge. It’s also believed that Kualoa is the burial place of hundreds of chiefs, who still make their mountain-to-sea trek on certain evenings in the form of ghostly nightmarchers. Just offshore, you’ll find MOKOLI‘I, commonly called CHINAMAN’S HAT. In legends, this islet is described as the tail flukes of a lizard-dragon killed by Hi‘iaka, the goddess of lightning (who also happens to be Pele’s baby sister). owners have long been dedicated to preserving and protecting Kualoa from development and have designed tours showcasing the cultural significance of the land. The JUNGLE EXPEDITION is a great activity for the whole family. You’ll board a six-wheeled Swiss Pinzgauer and rumble along jungle trails, down ravines, through rivers and up to a scenic lookout with views of Kane‘ohe Bay. On an ATV or horseback tour, you’ll go deep into Ka‘a‘awa Valley, where trails lead beneath cliffs and high above the ocean. You may even recognize a few sites; the valley has doubled as the back lot for numerous feature films and television shows such as “Jurassic Park,” “50 First Dates,” “Lost” and the newly revamped “Hawaii Five-0” — all stops along its MOVIE SITES & RANCH TOUR, Kualoa’s most popular. 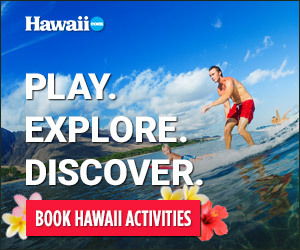 KUALOA EXPERIENCE PACKAGE includes three 90-minute Hawaiian Experience Tours that includes a ranch-style buffet and $10 per person transportation to and from Waikiki. Kualoa is open daily with free admission to the Visitor Center, restaurant, gift shop, History Hall, Judd Theatre and petting zoo.